I'm not sure how many road trips we make a year. At the very least four. 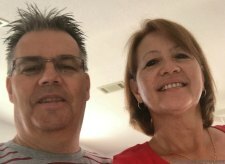 We live in North Carolina half the year and Florida the other half so there and back is two already. Our family and friends live in New York and this year alone we were there and will be there for our daughter-in-laws baby shower, birth of our grandchild, our soon-to-be daughter-in-laws bridal shower, our grandchild's christening and our son's wedding. Add ten more ten hour rides in the car! Then there's a few more vacations and weekend trips to make in between. I think that we are very fortunate to have such an active retirement life. The only problem is, since retiring, we have been spending a lot more time in the car and still have old habits of not counting calories of the food we consume on the road. For some reason we thought it was OK to eat a whole bag of chips, along with our huge sandwich, because we were eating in the car and not at the kitchen table. And we never left home without a gigantic bag filled with calorie laden snacks. We finally decided, when we were planning our trip to New York for the birth of our grandson, that we needed to start making better choices when eating on the road. 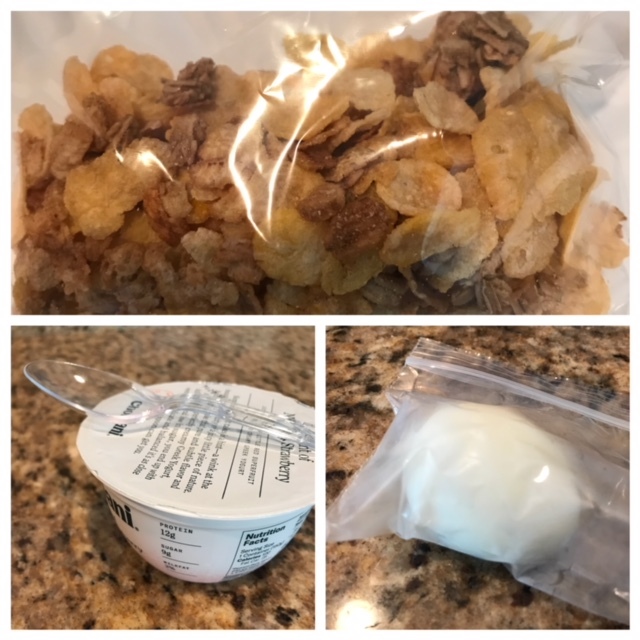 If we did forget our breakfast, a healthier choice at McDonalds's would be to have their oatmeal plain (150 cals) or parfait without granola (128 cals). We loved stopping at Burger King to get a Whopper for lunch but at a whopping 630 cals (without cheese) this lunch definitely needs a healthier substitute. 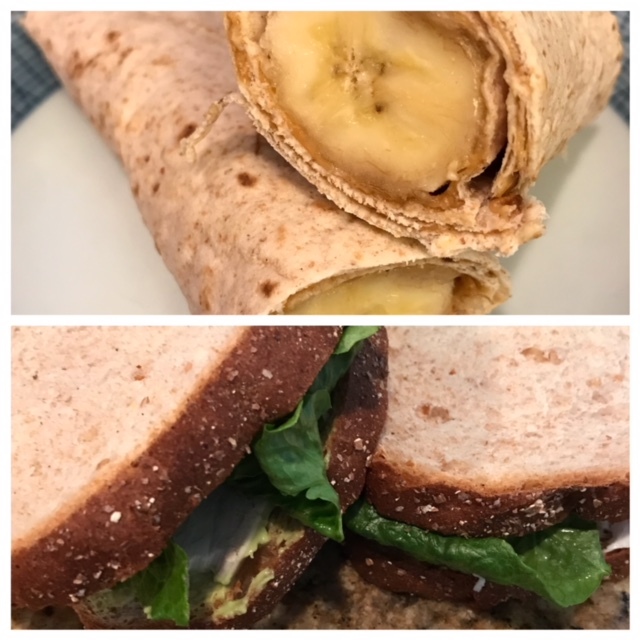 Wrap medium banana with a whole wheat burrito-size tortilla spread with 1 tbsp. peanut butter. Instead of buying cold cuts which are very high in sodium, we bake chicken breasts or get an already prepared roasted chicken at the grocery store to make our sandwiches with. Whole wheat bread, romaine lettuce and avocado spread*, for a healthier fat, makes this a healthy choice. *1 ripe avocado, 2 tbsp. light mayo and 1 tsp. lemon juice. Blend and spread. - 30 cals per tbsp. Snacks contributed to the majority of our overeating in the car. We got in a bad habit of filling an entire grocery bag with salty and sweet goodies. Eating snacks in the car kept the kids entertained and helped pass the time away in the car. We could get away with snacking when we were younger and our bodies could work off the calories, not so much anymore! I like 100 calorie snack packages when I'm keeping track of calories. But the cookies and chocolate snacks are empty calories. These two snacks are better choices. Popcorn - 1/4 cup of kernels popped in a brown lunch bag in the microwave with a quick spray of popcorn flavoring and a dash of salt. Popcorn gives us some of the fiber we need in our daily diet. Edamame - packaged individually in 100 calorie packages. (There is no need to cook the edamame although the package tells you too. I grab the packages and go and they are thawed and ready to eat when I am ready to eat them.) Edamame is rich in protein, antioxidants and fiber. I know that vegetables have zero calories if you are on Weight Watchers. We are not on Weight Watchers but I don't count the calories of most vegetables. Besides for a few, like corn, peas and potatoes that are high in starch, and higher in calories, vegetables are low in calories anyway. I do like to use a light ranch dressing so I count the 80 calories for 2 tbsp. Or I bring individual serving packs of hummus that I get at Costcon to dip the veggies in. Each pack is 2.4 oz. and are 160 cal. 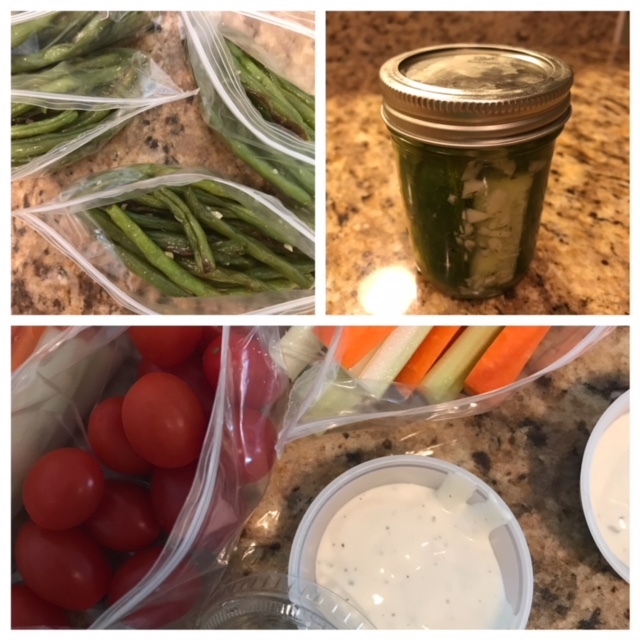 Making individual portions, using snack bags, makes it easier for us to eat the veggies in the car. We love snacking on leftover veggies, especially green beans. I like to roast veggies in the oven with a little olive oil, garlic and salt for dinner. I always make extra because we enjoy them as a snack right out of fridge the next day. I will sometimes cook extra veggies for dinner the night before a road trip so we can take some on the road. My daughter makes the best pickles. And the pickles make a great snack on the road. Fruit is our favorite snack on the road. We count calories and use portion control with fruit. 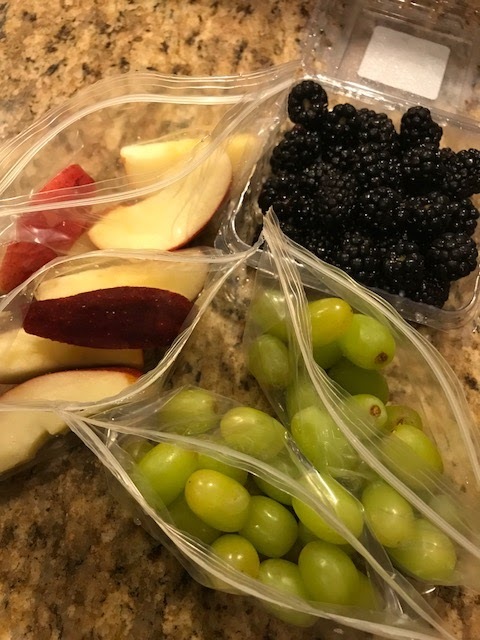 I portion the fruit so that each serving is 50 calories which makes it easier to keep track of. The snack that we really miss the most is the chips. Potato chips, nachos and the rest. The salty, crunchy snack has always been a treat that we avoid normally but we'd always bring a bag or two on the road with us. We haven't found a great substitute for the chips yet but have found that roasted beans and peas gives us the saltiness we want and a bit of the crunch. Roast beans or peas in 400 degree oven for 30 minutes. Put roasted beans or peas in bowl and add a small amount of olive oil, salt and any of your favorite seasonings. Mix to coat then return to oven for another 15 minutes. What do you eat in the car on your long road trips? Do you have favorite healthy snacks you like to bring in the car with you? We would love to add your favorites to our list! What a great list! Thank you for this! I think my son would really like the banana wrap! So glad you found something new for your son to try here. Thanks for stopping by! 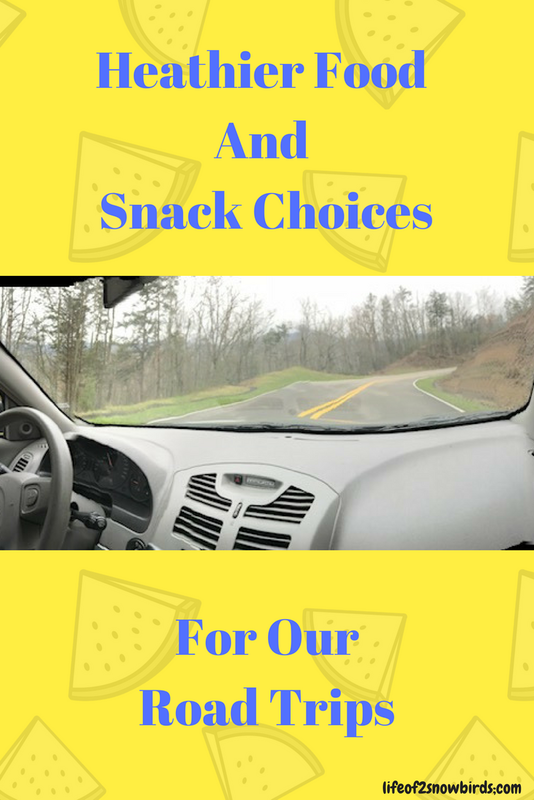 My husband and I were just talking about how we need better snack ideas for our road trips! We are headed to Canada in three weeks, a 12 hour trip. These are some great ideas. Thanks for sharing! I'm glad you found some snack ideas for your road trip here. Have a wonderful vacation! Thank you so much for sharing your ideas for healthier snacking. I will add them to my list! Isn't funny a road trip food can feel like an opportunity to eat whatever you want? I guess that's okay if you only travel occasionally, but as you pointed out, if it's a way of life, it adds up quick. Thanks for the healthy snack ideas. These would work well for me during a long work day as well. Thanks for linking up at #BloggingGrandmothersLinkParty! Safe travels! 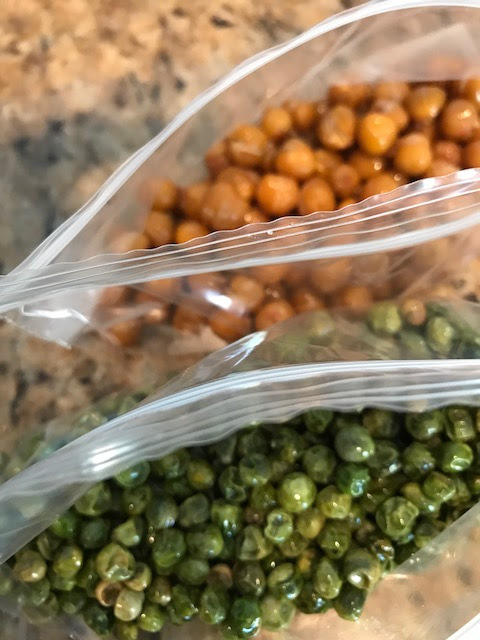 Making individual bags makes it easier to keep track of snacking during the day also. Glad you found some helpful ideas! Yes! Eating in the car is much easier than having to stop and get something on the road and there's not too many choices for sure. Thanks for sharing. Great tips! I love all your suggestions. I always blow my normal healthy diet every time I travel too. Have you tried dipping your veggies in hummus instead of ranch dressing? It's really good for you! I do love hummus but don't always have it around. That is a great suggestion!! I'm adding it to my list. Thanks! Some really good and delicious ideas! Thanks. I do miss the days when we could each chips without worrying too much about it though haha! We also travel by car a lot and do have unhealthy snacking habits. The last time we drove to Fl. husband spent $100 on snacks.Thanks for the great tips. Your husband must have entered the store with an empty stomach! Great post! We are currently on a road trip enjoying any of these same snacks! Good for you! Enjoy your trip!! I've been thinking it's about time to change some of my snacking habits while traveling. Thanks for the great ideas! You might like edamame. It's fun popping the little seeds into your mouth and they are delicious and so good for you! Well, what a good list. We always pop the calorie-laden snacks in the car as well. I love popcorn so that is an excellent choice for us and making our own sandwiches is a great idea as well. I had never heard of edamame. So will be checking that out. 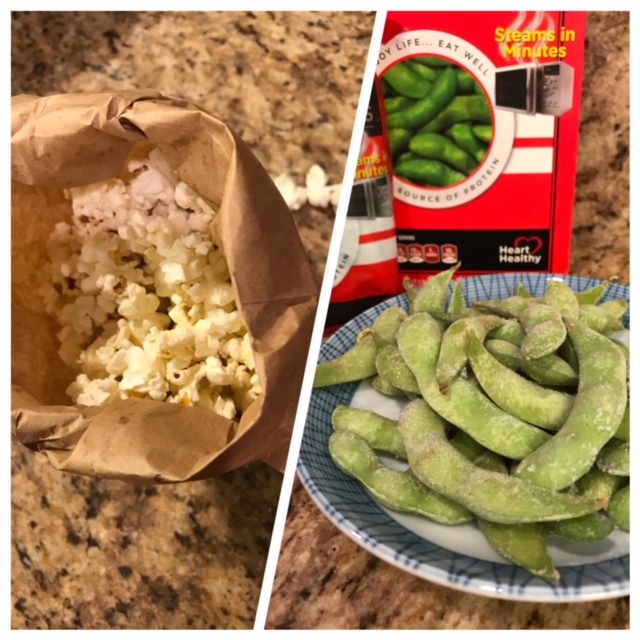 Edamame are soy beans and are a really healthy snack so I hope you will try them. Put the whole pod in your mouth (I like to salt the pods if they are not salted already) and, using your teeth, pop the beans into your mouth and then discard the pod. Hope you like them!